HGTV star Genevieve Gorder recently finished a massive renovation of her New York City brownstone, combining her original unit with the one next door when it came up for sale. It took over a year, but Gorder took her tiny apartment and turned it into a two-story apartment with three bedrooms and three bathrooms. She sat down with SheKnows to share some decorating tips you can use from her beautiful apartment in your own home. Gorder says, “Mix high-end pieces with lower-end finds to give any space contrast and a unique aesthetic.” Got a room you need to fill but not a big budget? Don’t be afraid to set that Ikea coffee table next to the beautiful antique you got from your grandmother. When decorating a room that you know could get cluttered, such as an office or a kids’ play room, use white walls and furniture to keep it looking neat and clean. Gorder says, “In rooms that lack natural light, decorate with white and add neutral accents, like gray and gold, to keep it bright.” If you’ve got a dark room in your house, lighten it up with white accents and golds that reflect light. Gorder says, “Mount televisions on the wall. It saves tabletop space and can serve as the centerpiece for a beautiful, eclectic art display.” Even if you have a flatscreen TV, you still need a piece of furniture to put it on, which can use up valuable space. Clear up floor space by anchoring the TV to the wall. Gorder uses the full-motion wall mount from SANUS. 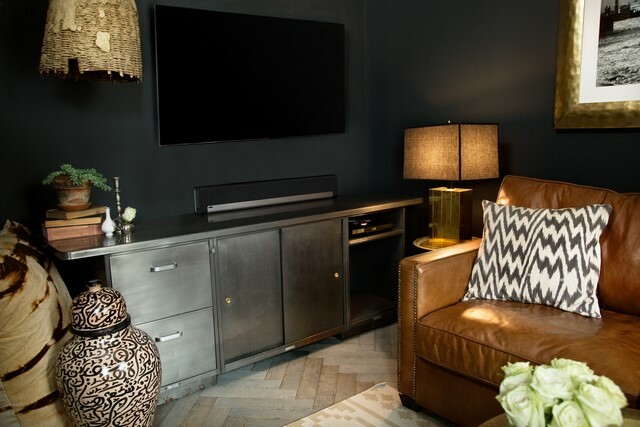 Gorder says, “Position decor items against black pieces to make them look more beautiful, dramatic and noticeable.” A black wall in a small room may sound like a bold choice, but just look at how it makes everything else in the room pop. Gorder says, “Use reflective surfaces and oversized furniture wherever possible to make the space look bigger.” Don’t be afraid to use large pieces of furniture in a smaller room; it actually can help make the space look larger. Have a tiny room in your house? Borrow Gorder’s idea for her bedroom and install a huge mirror to make the room appear bigger. 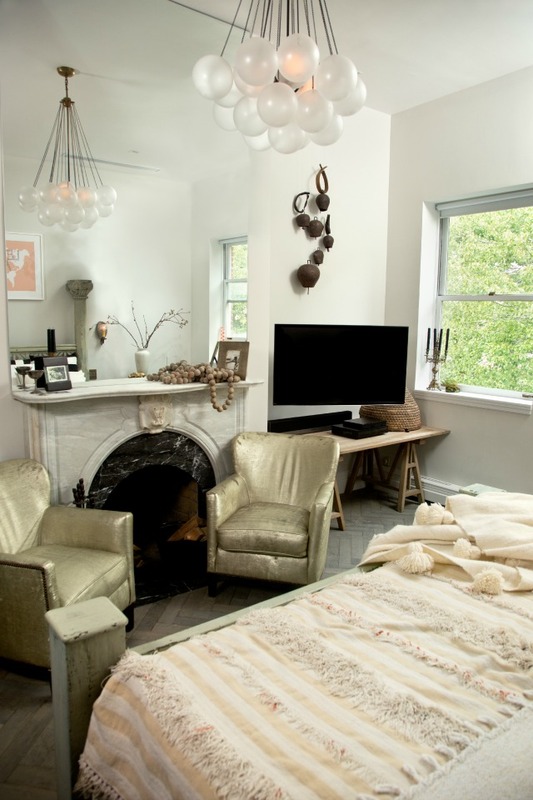 Check out how much more light there is in the room, thanks to the mirror she has above her fireplace. If you’re worried that your living room is too tiny to fit a Christmas tree or other holiday decorations, think again. Adding festive decorations is the best way to bring happiness and cheer into your home during the holidays.